The “Gold Yarrow” 《黃金策》 which was believed to be written by LIU Ji 劉基, the military counselor of the first Emperor of the Ming 明 Dynasty, has never been found published as a single book. The latest appearance of which was found in a book titled “The Genuine of Divination using Hexagrams” 《卜筮正宗》 written by WANG Hong-xu 王洪緒 of the late Qing 清 Dynasty. Though the book referred to Divination using Hexagrams, it is just simply all about Wen-Wang Gua 文王卦. The “Gold Yarrow” consists of two major parts: one being the general deciphering rules and guidelines. It is the beginning chapter of the book and it lays the foundation of how a hexagram should be read. The second part of the book is in fact the practical applications per different types of inquiries. Be it as simple as weather forecast to as complicated as the nation’s outlook. The “Gold Yarrow” is considered as a must read doctrine for all WWG Practitioners. The author used a lot of historical events prior to the Ming 明 Dynasty to highlight the points he wanted to make, which made the book extremely difficult to comprehend. The purpose of “A Guide to the ‘Gold Yarrow’”, though it makes the “Gold Yarrow” easier for people to understand through the experience and knowledge of the author, is to guide thinking and developing your understanding. 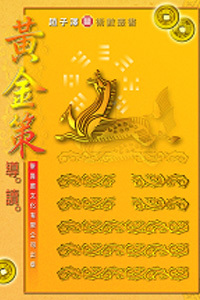 This book is intended for people who wish to master the deciphering skills of Wen-Wang Gua. You can have an English translation.